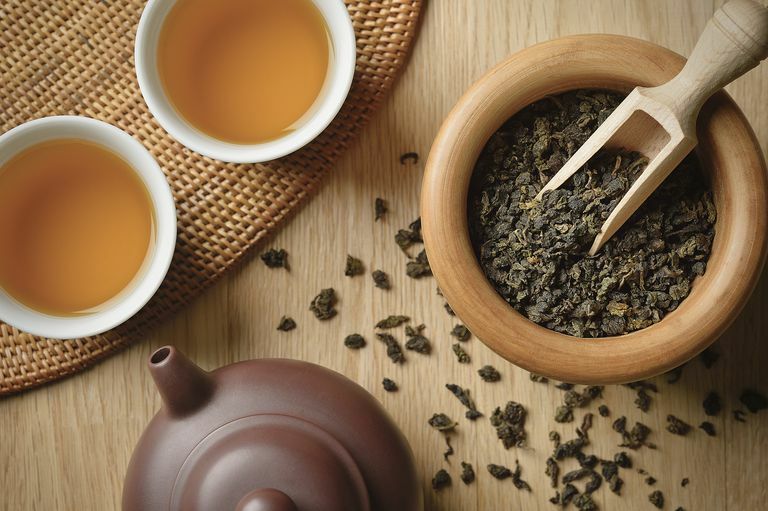 What Is Oolong Tea and What Are Its Benefits? Can sipping this distinctly mellow tea boost your health? Besides caffeine, which is also found in green, white, and black tea, oolong tea contains theanine, an amino acid found to promote relaxation. For a study published in Pharmacognosy Magazine in 2016, researchers analyzed 37 commercial tea samples and found that the mean theanine content of oolong, white, green, and black teas was 6.09, 6.26, 6.56, and 5.13 mg/g, respectively. The caffeine content was 19.31, 16.79, 16.28, and 17.73 mg/g, respectively. Proponents claim that sipping oolong tea may offer benefits for heart health, diabetes prevention, bone health, and weight loss, possibly due to the antioxidants thearubigins, theaflavins, and EGCG. Here's a look at several key study findings. In a population study published in the Journal of Epidemiology and Community Health in 2011, researchers found that consumption of oolong tea was linked to a reduced risk of mortality from cardiovascular disease. Participants included 76,979 adults, all of whom were ages 40 to 79 and free of stroke, heart disease, and cancer at the start of the study. In a study surveying members about their beverage consumption, the researchers determined that those who drank coffee, green tea, and/or oolong tea on a regular basis had a lower risk of heart disease compared to those who didn't drink such beverages. Tea consumption is associated with better quality of life in older adults, according to a study published in The Journal of Nutrition, Health, and Aging in 2017. After analyzing data from adults aged 60 years or older, habitual tea consumption was associated with better quality of life (specifically, mobility, pain or discomfort, and anxiety and depression). The associations were more pronounced for oolong and black tea than green tea. Other studies have investigated the association between tea consumption and the risk of cognitive disorders in older adults. A study, published in the Journal of Nutrition, Health, and Aging in 2016, found that older adults who consumed tea from oolong, green, or black tea regularly had a reduced risk of cognitive disorders. Several studies indicate that oolong tea may help promote weight loss. In a 2009 study of 102 overweight or obese subjects, for instance, researchers concluded that consumption of oolong tea could improve fat metabolism and, in turn, reduce body weight. After six weeks of drinking oolong tea daily, 64 percent of obese subjects and 66 percent of overweight subjects lost more than 2.2 pounds. Overall, 22 percent of participants lost more than 6.6 pounds. Previous studies suggest that oolong tea's anti-obesity effects might be due to its caffeine or polyphenol content. In some people, large amounts of caffeine may lead to a number of adverse effects such as anxiety, insomnia, increased heart rate and blood pressure, and the worsening of ulcer symptoms or may not be right if you have certain conditions or are taking medication. Pregnant or breastfeeding women and children should consult their healthcare providers before consuming oolong tea regularly or in large amounts. Tea naturally contains fluoride. While fluoride is believed to improve dental health, in large amounts it may have harmful effects on the body. For a study published in the Journal of Food Science, researchers analyzed 558 tea products and determined that oolong tea had mean fluoride levels of 159.78 mg/kg, compared to 63.04, 99.74, 52.19, 101.67, and 110.54 mg/kg for green tea, black tea, white tea, pu'er tea, and reprocessed tea, respectively. Although oolong tea can be a delicious addition to your beverage rotation in moderation, it's too soon to view it as a treatment for any condition. And while it may offer certain health benefits, it's important to consult your healthcare provider to determine how much might be appropriate for you. Boros K, Jedlinszki N, Csupor D. Theanine and Caffeine Content of Infusions Prepared from Commercial Tea Samples. Pharmacogn Mag. 2016 Jan-Mar;12(45):75-9. Feng L, Chong MS, Lim WS, et al. Tea Consumption Reduces the Incidence of Neurocognitive Disorders: Findings from the Singapore Longitudinal Aging Study. J Nutr Health Aging. 2016;20(10):1002-1009. Mineharu Y, Koizumi A, Wada Y, et al. Coffee, Green Tea, Black Tea and Oolong Tea Consumption and Risk of Mortality From Cardiovascular Disease in Japanese Men and Women. J Epidemiol Community Health. 2011 Mar;65(3):230-40. 8. Pan CW, Ma Q, Sun HP, Xu Y, Luo N, Wang P. Tea Consumption and Health-Related Quality of Life in Older Adults. J Nutr Health Aging. 2017;21(5):480-486. Peng CY, Cai HM, Zhu XH, et al. Analysis of Naturally Occurring Fluoride in Commercial Teas and Estimation of Its Daily Intake Through Tea Consumption. J Food Sci. 2016 Jan;81(1):H235-9. Is Matcha Better for You Than Regular Green Tea?